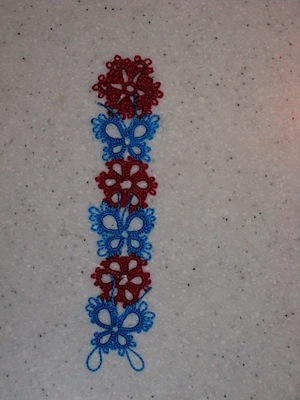 These two motifs are for my tatting round robin partner, Connie. 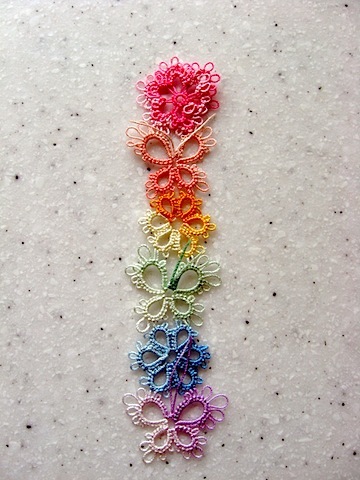 In a tatting round robin, you specify some theme (colors, thread, etc.) and each person in the round robin contributes an item. 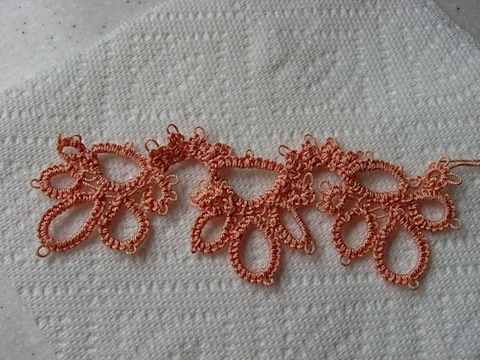 In some round robins, the item is a doily– each person starts their own doily, then the next partner adds a row of their own design, the next person adds another row, etc. 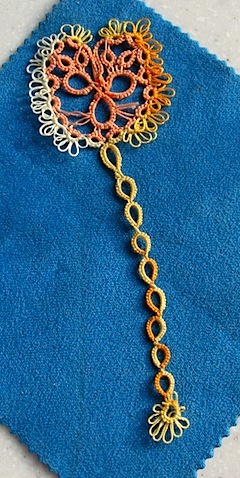 In this round robin, we’re all beginners, so the motifs tend to be small, like bookmarks. In the round robin I sent out, I asked for flowers. It’s a little hard to see, but the red and blue are both very intense shades. 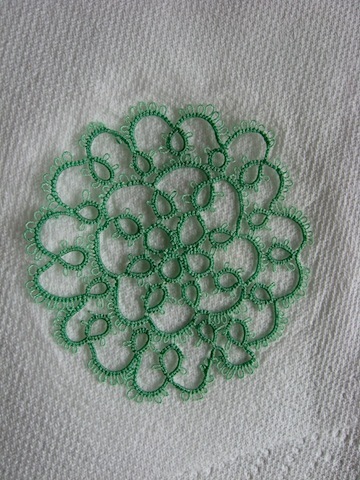 A green version of the Cherub Doily, for which I finally learned how to make a split chain, go me. This bit is from over a month ago. It’s a One Shuttle Scalloped Edging (PDF), by Mark Myers. 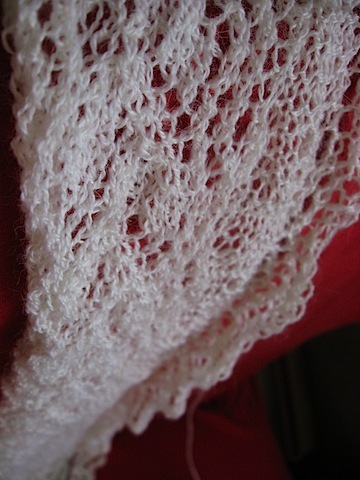 I continue my forays into lace with the border of the Magickal Earth Shawl. There are 48 repeats of a 48-row pattern to make up the border (just the border– not the rest of the shawl!). 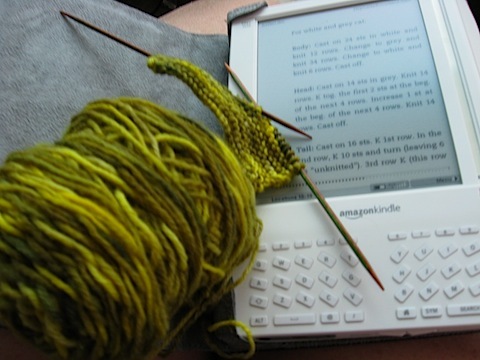 How many repeats have I done? Four. 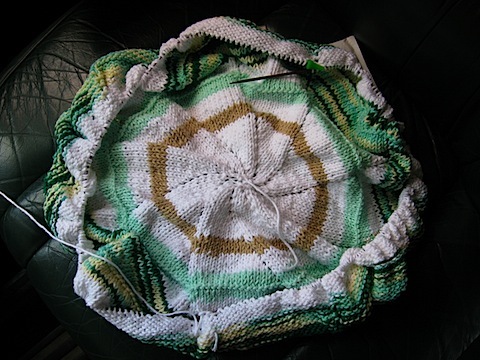 And a quicker, much more boring knit (the lace is at least exciting and takes a lot of attention), the Spiral Blanket. I’m knitting this in really plain cotton (Sugar n’ Cream), because it’s for a baby to lay on an crawl on and barf on, and I think moms appreciate having something that’s super-absorbant and super-washable. This is for my friend Ken’s new baby, who was born on St. Patrick’s Day. The last baby blanket I finished was for his first son. It’s just around and around and around, increasing by 10 stitches each row. I have another 24 rows to go before it’s done. It doesn’t look like it, but this is actually a cat in the process of being born. Really. It will be a knitted kitty when it’s all done, for a swap group on Ravelry. I also, in a fit of creative urging, went to the Knit Witz knitting nights on Wednesday and Friday last week, and joined in the fun and frivolity that is any good knitting group. It was fun. 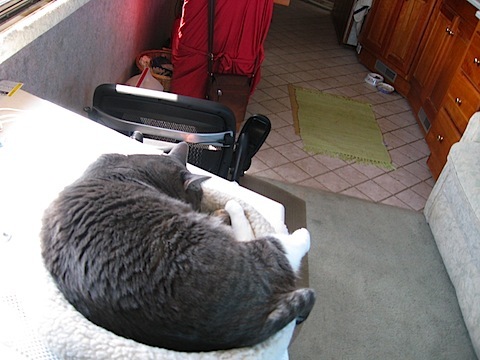 It was frivolity (literally, since I brought my tatting with me on Friday). There was even one male in the crowd (yay for male knitters!) While there, I bought enough sock yarn to make at least 3 pairs of not-quite-matching socks, a skein to make a pair of really cool stripey socks, and the yarn for Moonfire’s socks. 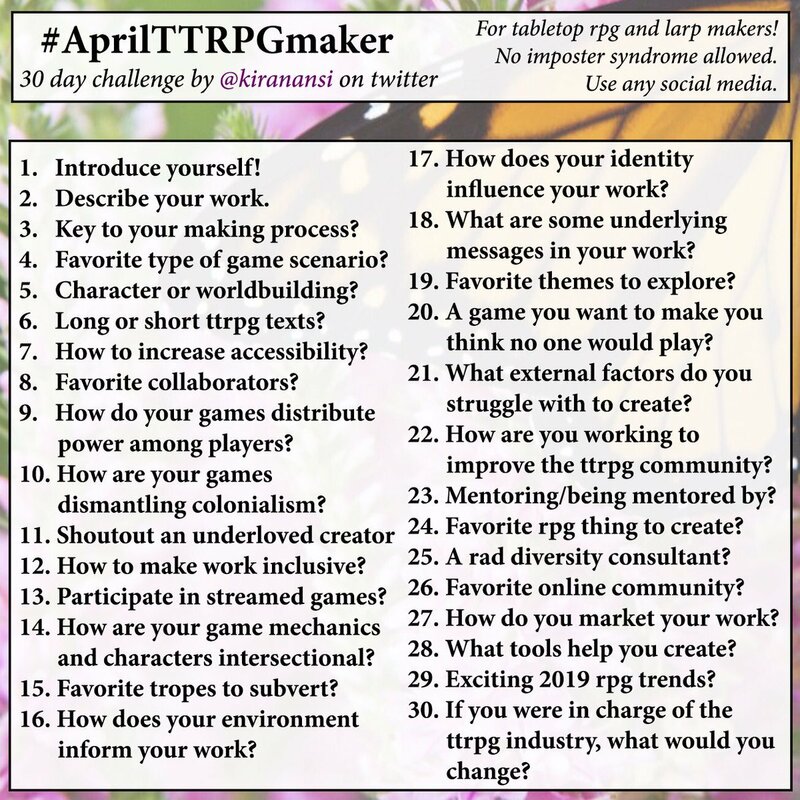 They are going to be awesomely beautiful, when I get to make them. Wow Mortaine, lovely bookmarks. I specially loved the rainbow colored flower & butterfly bookmark the most.